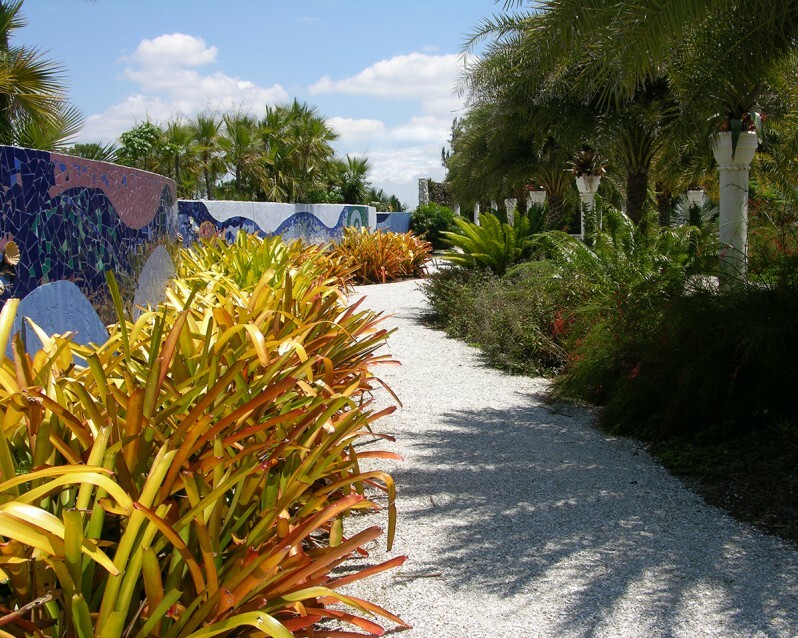 Prior to the Naples Botanical Garden completing their overall master plan, the Tropical Mosaic Garden was designed as a platform for prototyping diverse programs and activities.Today, it serves as a venue for weddings and other special events. 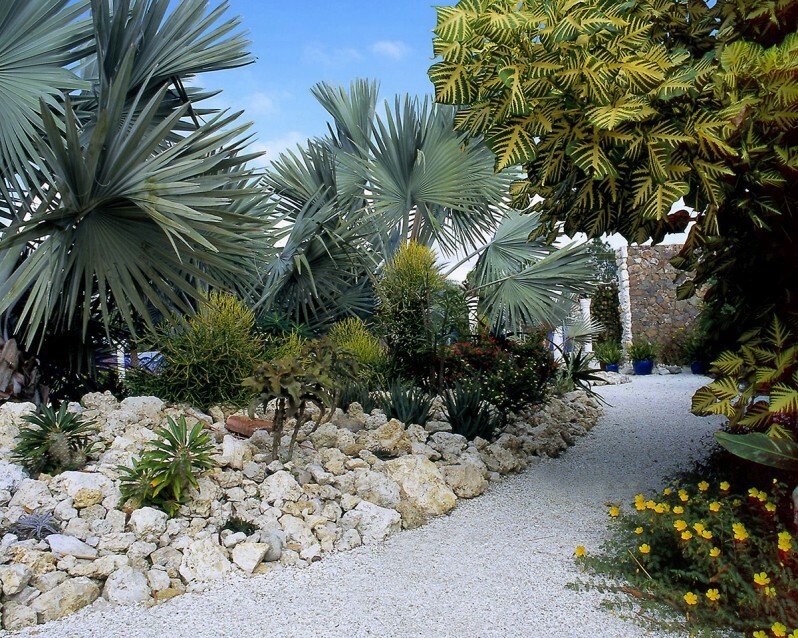 Horticulturist and garden designer Scott Ogden collaborated. 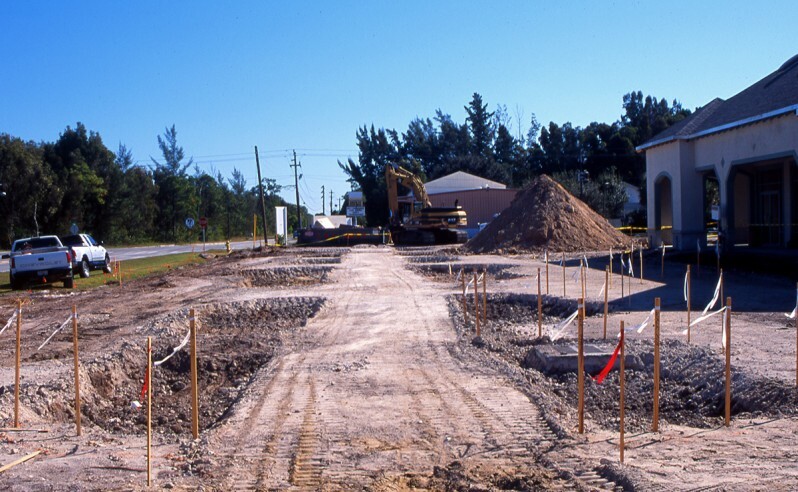 The site was originally a parking lot. 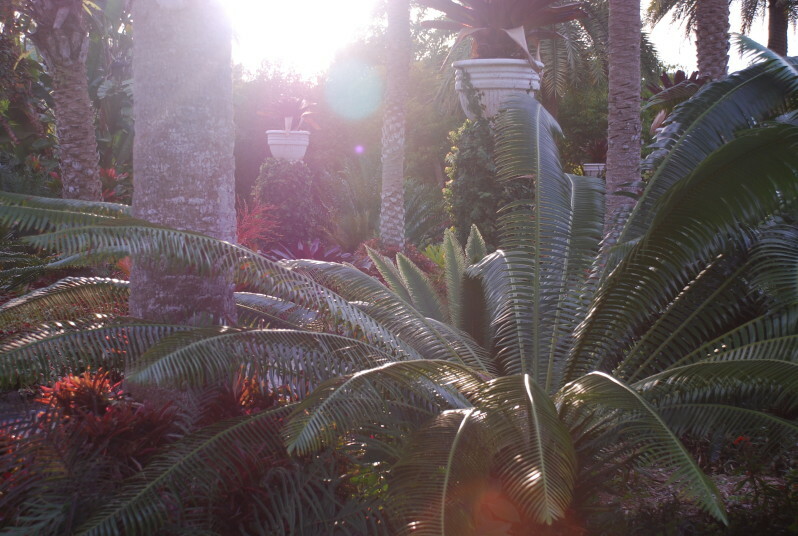 Here is the Silver Date Palm Allée under construction. 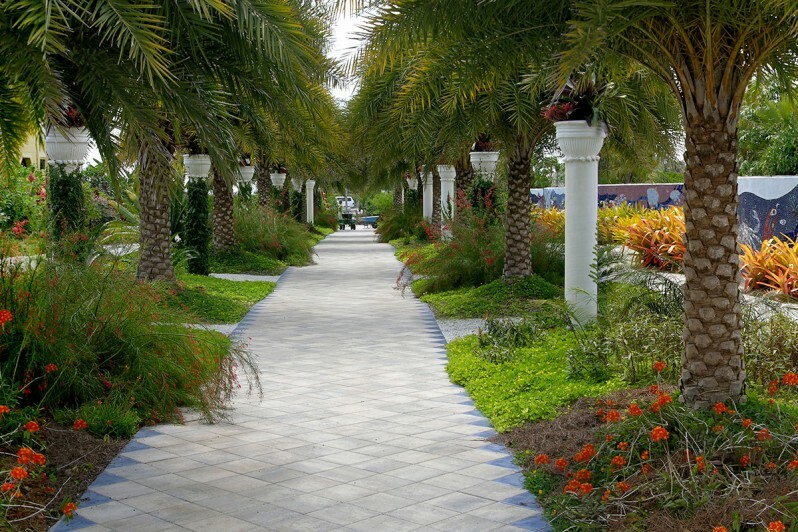 The Silver Date Palm Allée. 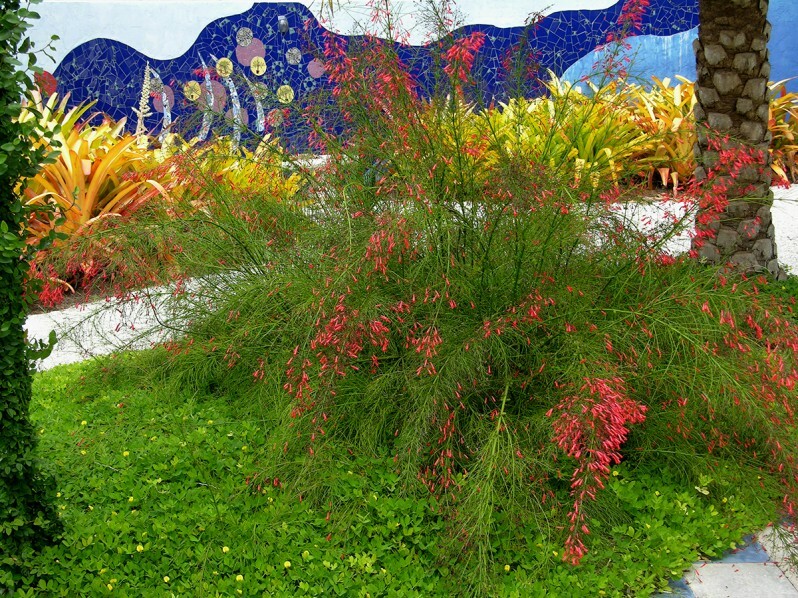 Red flower fountains of firecracker plant (Rusellia equisetiformis) punctuate the Silver Date Palm Allée. 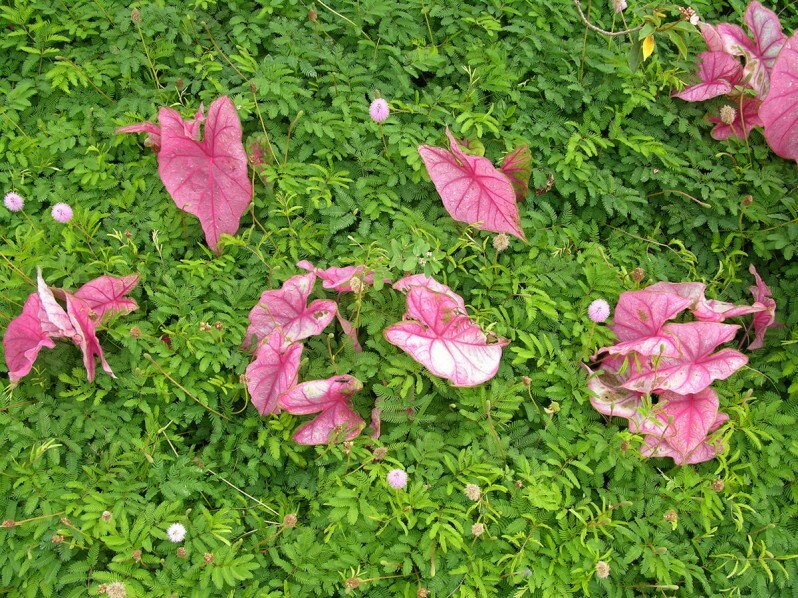 The ground covers in the Silver Date Palm Allée included Caladium ‘Thai Beauty’ and powderpuff mimosa (Mimosa strigillosa, a Florida native). 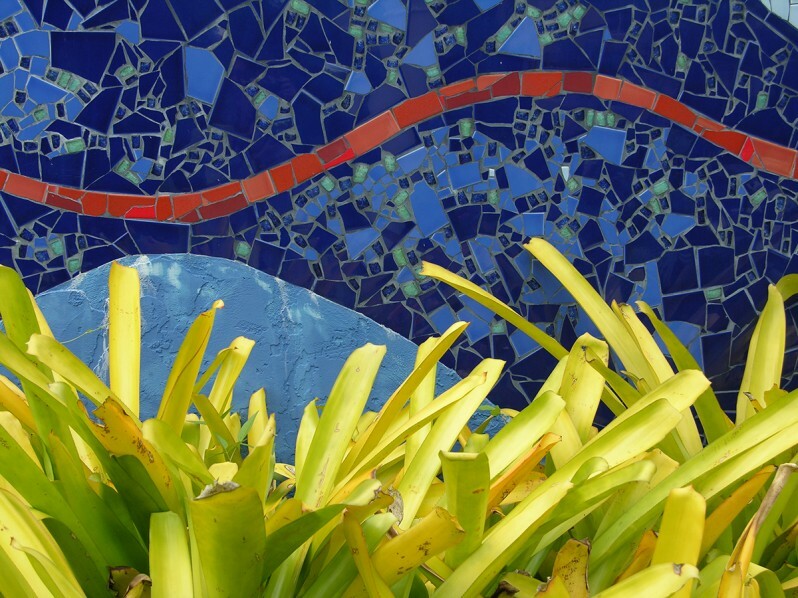 I worked for four weeks with a tile crew to create this blue tile mosaic wall, which forms a backdrop for masses of bromeliads (Achmaea blanchetiana) with cultivar names such as ‘Lemon’ and ‘Orange’. This giant microorganism pokes fun at the ultra-clean and sanitized nature of typical places in Naples. This serpentine red line is a section of the paramecium’s flagellum, which is 40’ long. 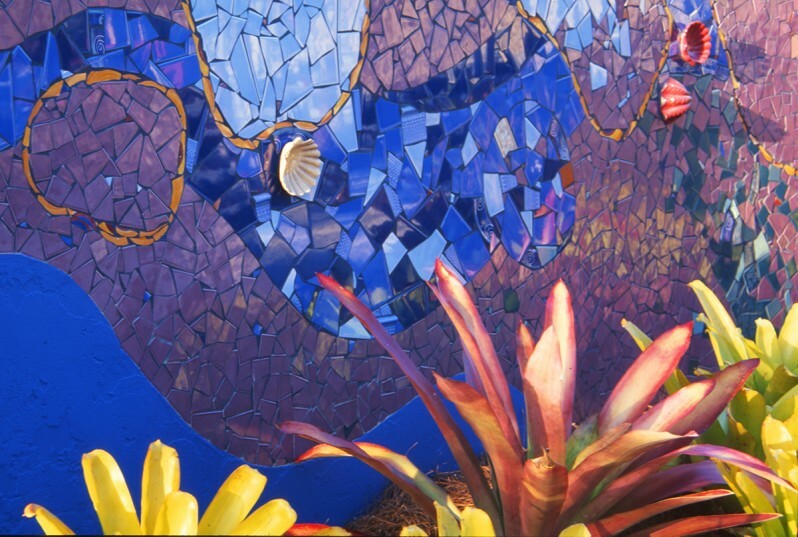 The mosaic tile wall was so popular, the garden was named “The Tropical Mosaic Garden”. The Bismarckia Island has spiky plants such as desert roses (Adenium spp. 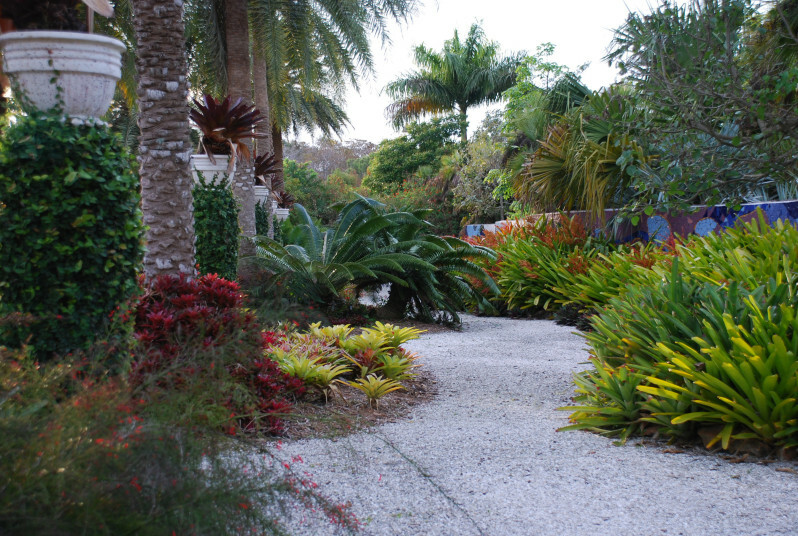 ), pachypodiums, and a selection of Thai hybrid crown-of-thorns (Euphorbia milii). 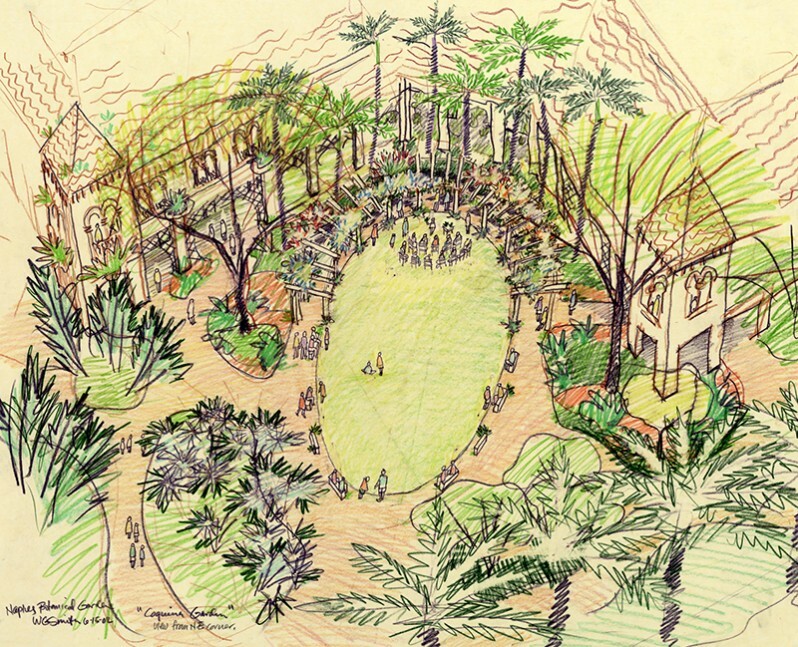 The centerpiece is the Coquina Courtyard, a space designed for activities and programming. 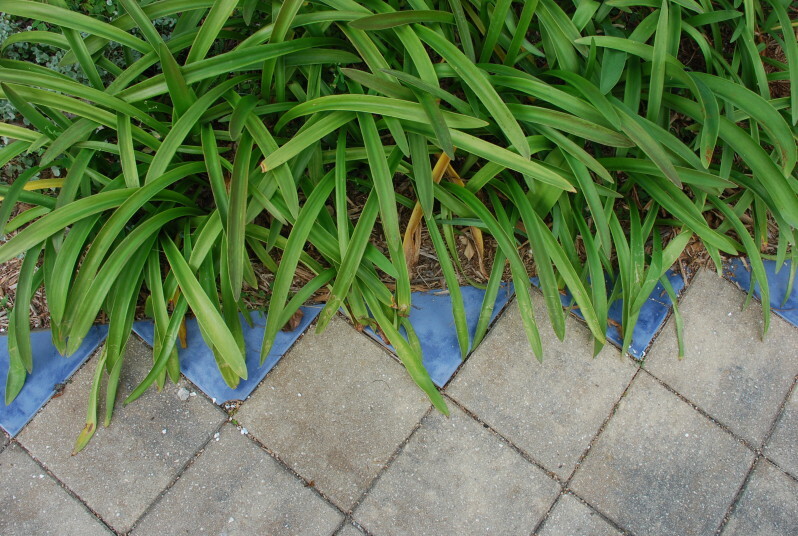 Painting was used as a way of connecting with the tropical plant palette. 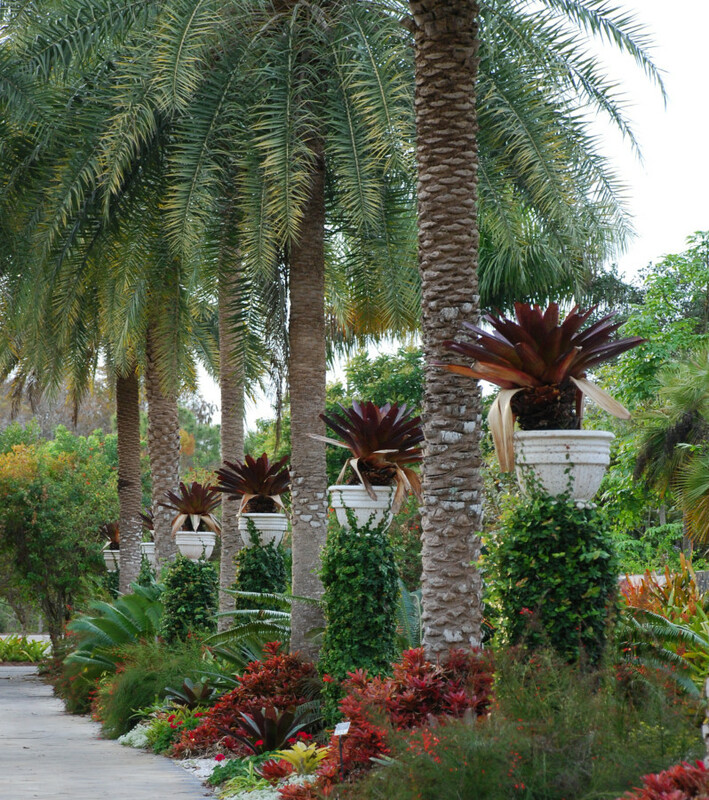 The Silver Date Palm Allée has alternating pairs of columns and palms. 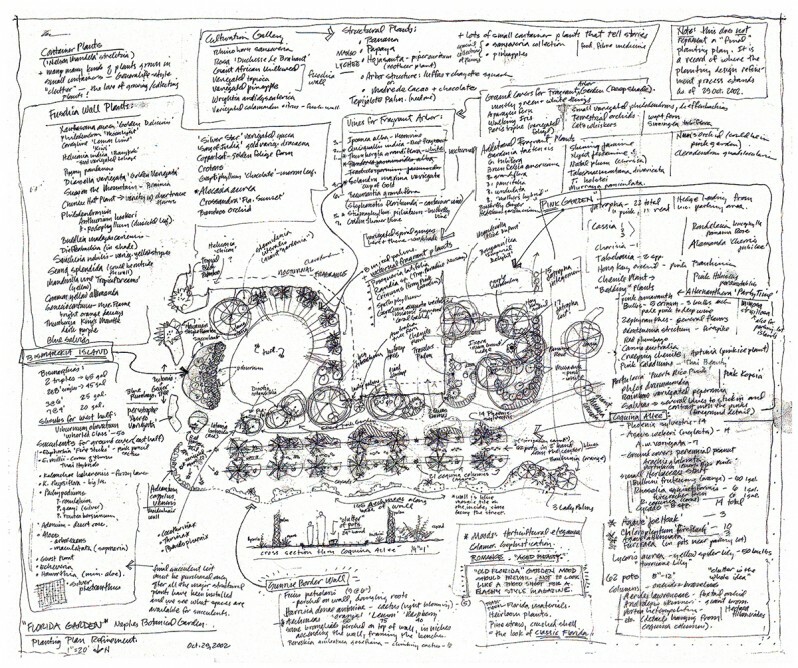 Since this was a fast-track project, the planting plan was a quick pencil drawing on tracing paper. A truckload of plants arrived at the site, and the design was refined as the plants were placed in their final locations.